Corridors extending an entire kilometer, insurmountable stairways, graphic codes, illegally occupied zones, vast murals – that is Corviale. Corviale, is a housing project on the outskirts of Rome, built between 1975 and 1982. Ten stories high, Corviale is nearly one kilometer long and houses over 8,000 residents – a whole city in a single building. In this project the author acted as an embedded artist, was part of the building to create this series. 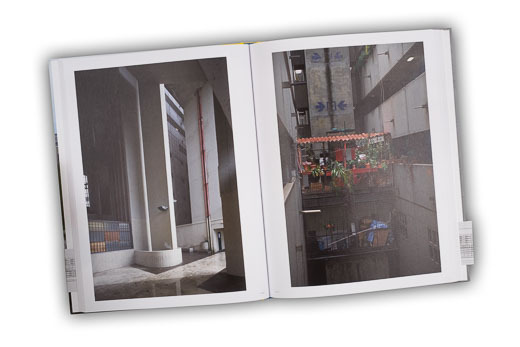 The book contains texts with background information by Angelika Fitz (from an urbanistic point of view), Gabriele Kaiser (architectural), Martin Hochleitner (photo theoretic) and Otto Hainzl (subjective point of view). Archive material is included in the text part. A facsimile of the original architecture plan is wrapped around the book to show proportions of the Corviale Universe. Prints are available in a limited edition, signed and numbered by the artist.